VIRGINIA BEACH, Virginia - BLACKHAWK, an industry leader in tactical products, will host a book signing with retired U.S. Navy SEAL, Lt. Cmdr. Jack Carr at booth #14551 at the 2019 Shooting Hunting and Outdoor Trade (SHOT) Show in Las Vegas. Carr, the author of The Terminal List will be signing copies of the book on Thursday, January 24 from 2:00 to 4:00 p.m. at the BLACKHAWK booth (#14551). 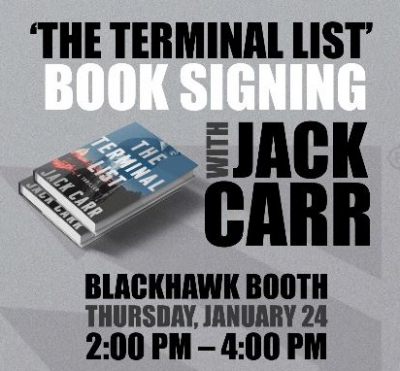 Attendees will be able to receive a free signed copy of The Terminal List by posting a picture of the signing table at the BLACKHAWK booth to Instagram and tagging @jackcarrusa and @blackhawk. Additional details will be available in the booth. Carr is a former Navy SEAL who led special operations teams as a Team Leader, Platoon Commander, Troop Commander, Task Unit Commander, Operations Officer and Executive Officer. During his 20 years in Naval Special Warfare he transitioned from an enlisted SEAL sniper specializing in communications and intelligence, to a junior officer leading assault and sniper teams in Iraq and Afghanistan, to a platoon commander practicing counterinsurgency in the southern Philippines, to commanding a Special Operations Task Unit in the most Iranian influenced section of southern Iraq throughout the tumultuous drawdown of U.S. Forces. He is the author of the political/military thriller titled The Terminal List, published by Emily Bestler Books/Atria in March 2018. His second novel, True Believer, will hit shelves in April 2019. BLACKHAWK is a manufacturer of premium tactical gear for military, law enforcement and civilian markets. Under the leadership of new President Josh Waldron, BLACKHAWK maintains a manufacturing facility in Manhattan, Montana and recently opened a headquarters in Virginia Beach, Virginia, which is home to more than 86,000 active-duty personnel representing every branch in the Armed Forces—and the largest concentration of military personnel outside of the Pentagon. In 1990, a Navy SEAL was navigating a minefield when his pack failed. As his gear tumbled to the ground, he vowed that if he got out of there alive he would make gear the right way. Today this obsession with quality applies to everything we do. We’re constantly researching, refining and perfecting every detail to provide gear that won’t let you down. Because we’re not just making stuff. We’re honoring a vow. For more information, visit www.blackhawk.com.